HAVE TO AND MUST je modalni glagol koji ima samo jedan oblik – sadašnji. Jedno značenje ovog glagola je obligation (obaveza) – koja postoji po mišljenju govornika: I haven’t spoken to Sue for ages. I must phone her. (Smatram da mi je to obaveza) Mark is a really nice person. You must meet him. (Preporučujem to, mislim da je neophodno) Ukoliko želimo da iskažemo obavezu u nekom drugom vremenu, umesto must, moramo upotrebiti have to It was very late. I had to go home. If the pain gets worse, you’ll have to see the doctor. 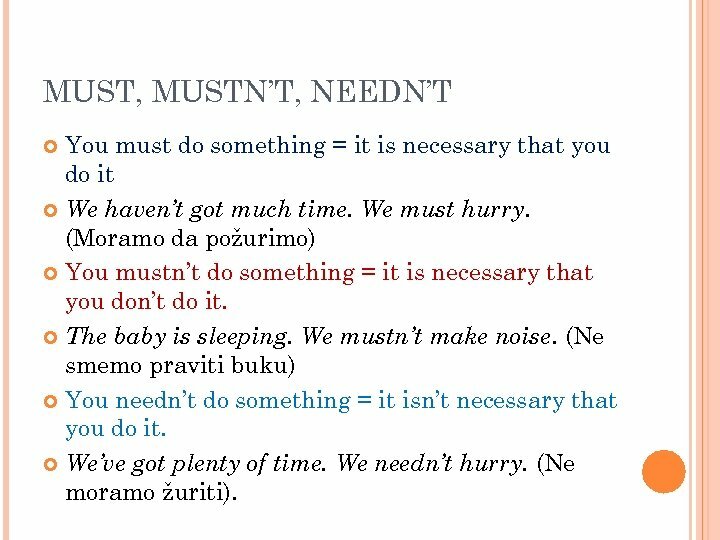 MUST, MUSTN’T, NEEDN’T You must do something = it is necessary that you do it We haven’t got much time. We must hurry. 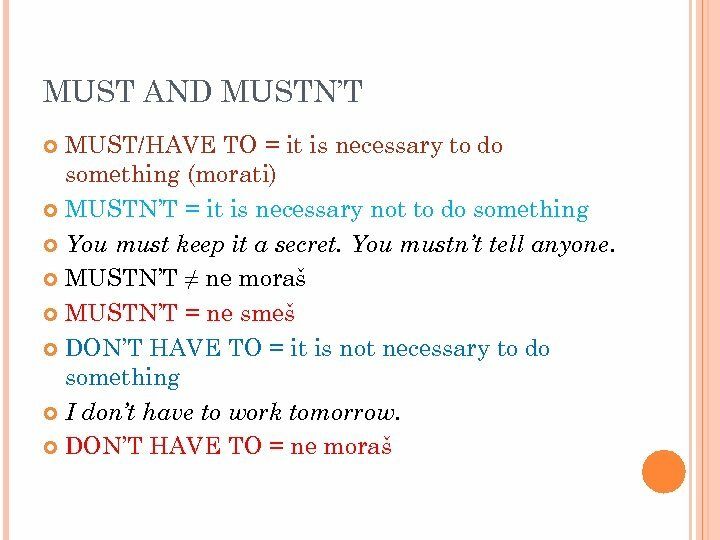 (Moramo da požurimo) You mustn’t do something = it is necessary that you don’t do it. The baby is sleeping. We mustn’t make noise. 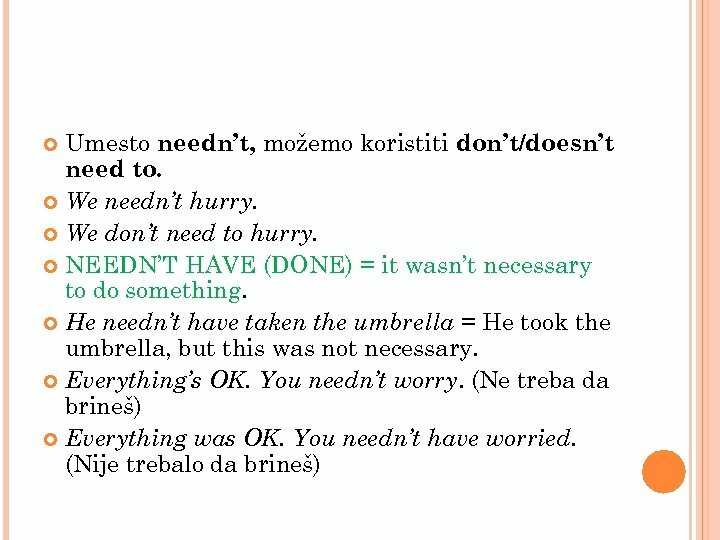 (Ne smemo praviti buku) You needn’t do something = it isn’t necessary that you do it. We’ve got plenty of time. We needn’t hurry. (Ne moramo žuriti). 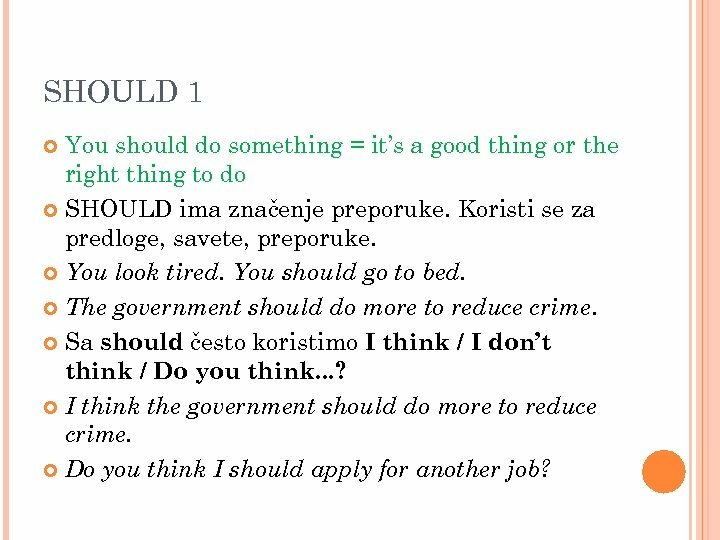 SHOULD 1 You should do something = it’s a good thing or the right thing to do SHOULD ima značenje preporuke. Koristi se za predloge, savete, preporuke. You look tired. You should go to bed. The government should do more to reduce crime. Sa should često koristimo I think / I don’t think / Do you think. . . ? I think the government should do more to reduce crime. Do you think I should apply for another job? You shouldn’t do something = it isn’t a good thing to do You shouldn’t believe everything you read in the newspapers. 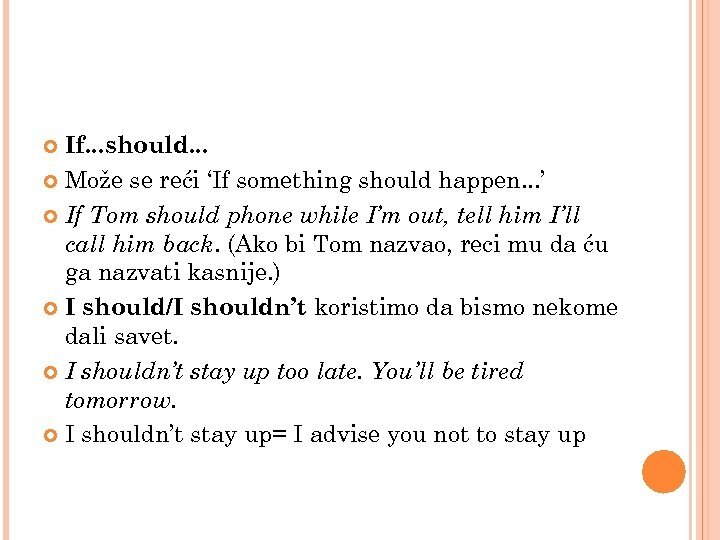 (Ne bi trebalo) Should nema istu jačinu kao must/have to: You should apologize. (= it’s a good thing to do. ) You must apologize. (=it’s necessary to do so. ) 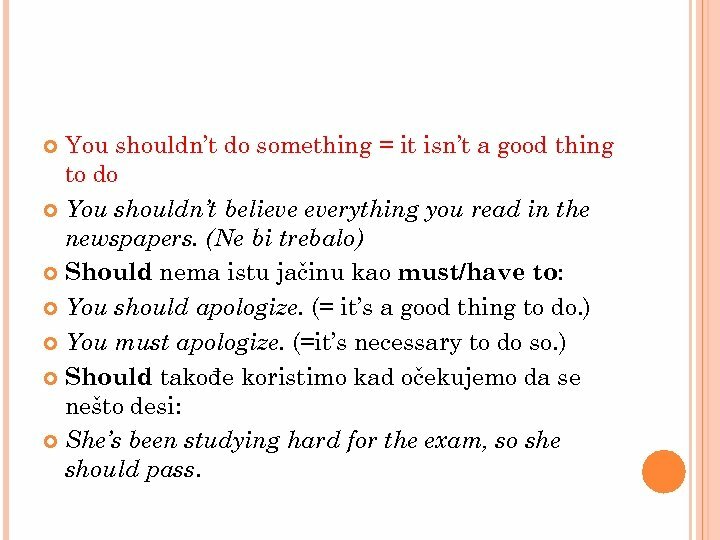 Should takođe koristimo kad očekujemo da se nešto desi: She’s been studying hard for the exam, so she should pass. 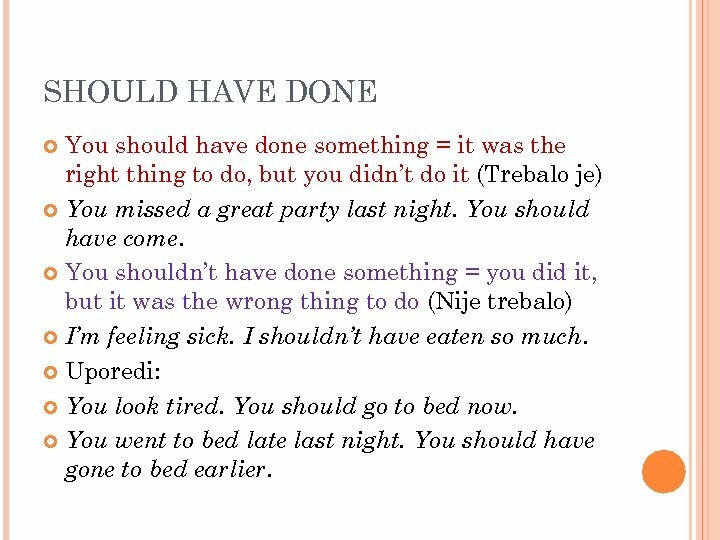 SHOULD HAVE DONE You should have done something = it was the right thing to do, but you didn’t do it (Trebalo je) You missed a great party last night. You should have come. You shouldn’t have done something = you did it, but it was the wrong thing to do (Nije trebalo) I’m feeling sick. I shouldn’t have eaten so much. Uporedi: You look tired. You should go to bed now. You went to bed late last night. You should have gone to bed earlier. OUGHT TO Umesto should, može se upotrebiti ought to, sa istim značenjem: Do you think I ought to apply for this job? She’s been studying hard for the exam, so she ought to pass. Jack ought not to stay up late. It was a great party last night. You ought to have come. SHOULD 2 Should se posebno koristi posle nekih glagola, kao što su: Demand – zahtevati Insist – insistirati Propose – predložiti Recommend – preporučiti Suggest – predložiti They insisted that we should have dinner with them. I demanded that he should apologize. WOULD/WOULDN’T koristimo kad zamišljamo neku situaciju ili aktivnost: It would be nice to buy a new car, but we can’t afford it. (Bilo bi lepo da kupimo nov auto, ali nemamo novca. ) I would love to live by the sea. (Volela bih da živim kraj mora. ) WOULD HAVE DONE koristimo kad zamišljamo situacije ili aktivnosti u prošlosti (koje se nisu dogodile): They helped us a lot. I don’t know what we would have done without their help. 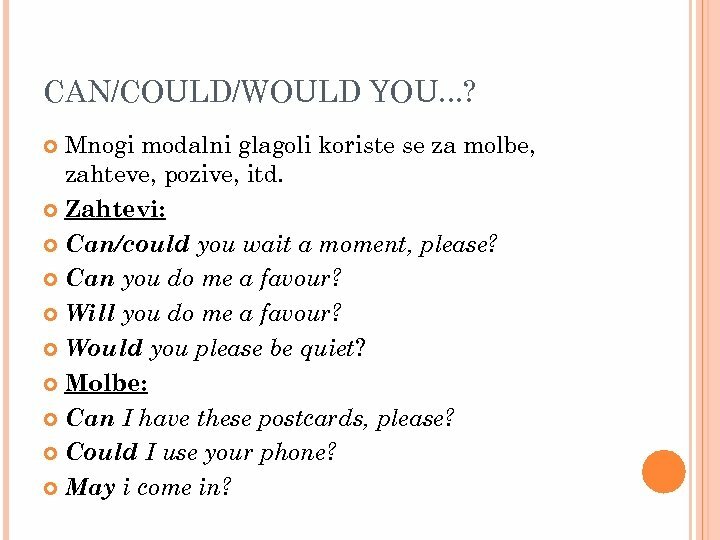 CAN/COULD/WOULD YOU. . . ? Mnogi modalni glagoli koriste se za molbe, zahteve, pozive, itd. Zahtevi: Can/could you wait a moment, please? Can you do me a favour? Will you do me a favour? Would you please be quiet? Molbe: Can I have these postcards, please? Could I use your phone? May i come in? Ponude i pozivi: Can I get you a cup of coffee? Can I help you? Would you like a cup of coffee? Would you like to come to dinner tomorrow evening? 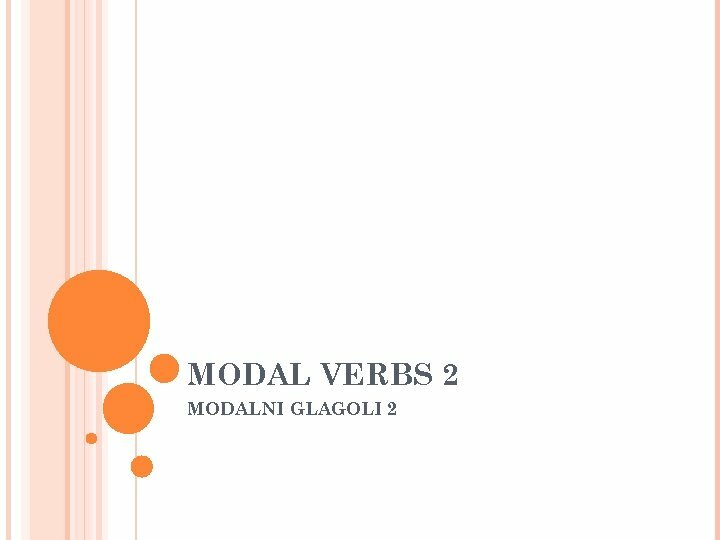 Modal Verbs What is a Modal Verb?